How can I be a guest on Covert Contact? 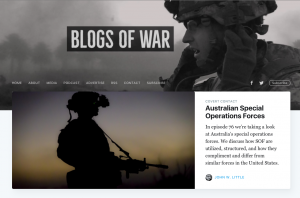 Reach out to John via one of the options on the Blogs of War contact page. Most interviews will be conducted via Skype. If you don’t have an account you’ll want to create one before the interview. Calls can be conducted via phone or mobile phone but Skype generally results in a better quality recording. From there on its no different than any other phone conversation. The length on the interview can vary but expect the process to take no more than one hour. I try to contact potential guests at least two weeks out from the date of their interview. Most are scheduled for Sunday evenings at 8PM EST. I may also contact you very briefly a few days before the interview to test the quality of our Skype connection. This process takes only a minute or two. I do not typically prepare questions in advance although I will give potential guests a feel for specific topics that I am interested in covering. I do ask guests to record a short biographical introduction at the start of the interview so giving some thought to what you want to say in that thirty seconds or one minute is a good idea. How is the show edited? It usually takes a day to edit the show. I may omit an exchange to cut the show down to a listenable length, remove long pauses, or do other things to improve the listener experience. I will not edit content in a manner that impacts your message or intent. If a guest says something in error and requests a specific edit I will do what I can to fix the problem or remove that exchange from the interview. Can the show be edited after it has been released? Yes but it would be a difficult and time consuming process that I would rather not take on except in extreme cases.